This wash day was more like a wash late night. I had a very busy day and I made the decision to wash early in the morning but change my mind last minute since I was up and didn't have much to do. Prepoo with Cantu Shea Butter leave-in conditioning repair cream for roughly 45 minutes under a plastic cap and my head tie. I did not feel like using my conditioning cap for this week's prepoo. As always my hair felt soft and after washing out the prepoo with cold water. Shampoo with Loreal Total repair 5 restoring shampoo. I bought this shampoo at the beginning of my hair journey and love that a get a good clean and that my hair remains soft and manageable. Tea Rinse with my brewed black tea by pouring over my head for 3 minutes before rinsing with cold water. My shedding is at a minimum and each week I see my hair getting darker ( I'm loving it). 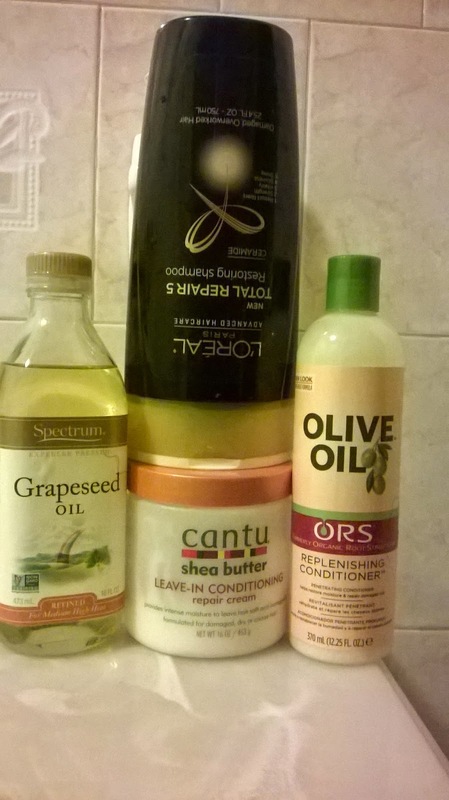 Deep Conditioned with ORS Olive oil replenishing conditioner and Grapeseed Oil under my conditioner cap for 30 minutes plus some because I lost track of time. I rinsed with warm water because of the oil and followed up with a cold water. Loving the feel of my hair; toweled dry for 2 minutes while researching how to do a high bun with weave hair on YouTube. 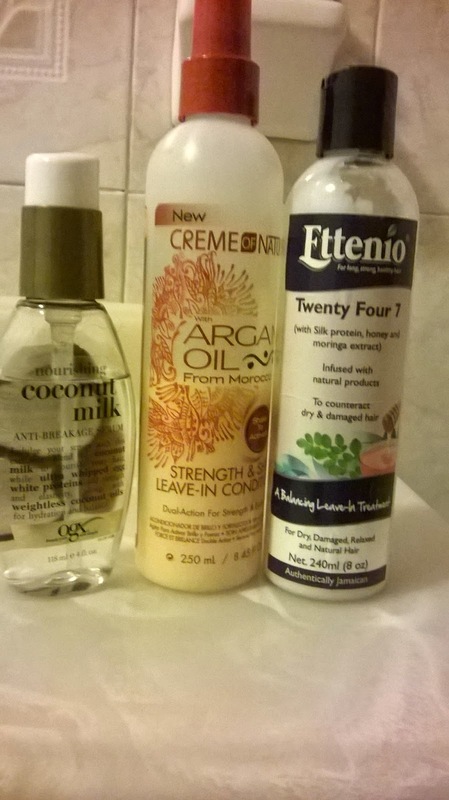 Apply Leave-In conditioner of Creme of Nature strength and shine leave-in conditioner, Ettenio twenty four 7 leave in treatment and OGX coconut milk anti-breakage serum before roller setting and calling it a night. Even though it was a very late night it was great wash day and will probably sporting a high bun mid-week. I've never heard of Ettenio. Let me go google that and check it out. This is a Jamaican natural hair product brand. You can find then on Facebook and I they have a distributor here in the US.